The sales of islands we’ve spotted being put up for sale are not usually as well highlighted as the offers for sale, so we usually miss them. But Tanera Mòr, bought by Ian and Saffron Wace in May 2017 for around £2 million, has broken surface and been noticed, probably because of the amount of redevelopment they’re going to try – if they don’t offend to many authorities. It’s no secret that many shy away from such things are there are now so many rules and regulations restricting change, or causing work to be expensive if traditional methods are demanded. Three communities – at Ardnagoine, Tigh-an-Quay and Garadheancal – are to be created so different groups of guests can occupy Tanera at a time or one large party can take over the entire island. Buildings will be made from “ruined structures” which are to be redeveloped “in keeping with their historical context and place within the wider landscape”. Cafes, social spaces and a church will also be built alongside an already existing post office. Staffing would include up to ten full-year residents, with an additional 20 part-time workers. Developers hope the the (sic) island, accessible by a ferry service from near Ullapool, will be a place for people “to escape to” for celebrations or those who enjoy creative pursuits. 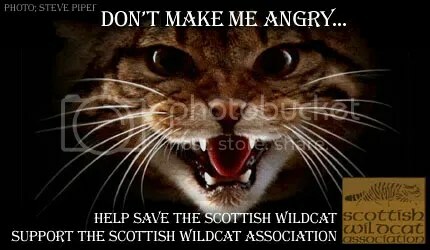 However, it has already hit a stumbling block as the Scottish Environment Protection Agency has objected unless modifications are made to the tracks so as not to disturb peat and wetlands. The island is home to various protected species including the European otter, and it has flora which is unusual for the area as there are no sheep, rabbits or deer to feed on it. I usually spot islands going up for sale, but I don’t think the initial offer made the major papers (it was in the Oban Times, and I spotted it in some of the larger titles, but not ones I get feeds from). The Isle of Ulva went on the market for around £4.25 million back in July (I think). It lies not far from the mainland, only a few hundred metres over the Sound of Ulva from the settlement of Ulva Ferry on Mull to the pier on the Ulva. In terms of size it is about 7.5 miles long, 2.5 miles wide, and a little over 4.500 acres. Ulva House was built in 1950, to replace its predecessor after a fire, and is B-listed. But perhaps more interesting than the fact of the sale itself is the reference to the Land Reform Act (2003) and how that is said to have allowed the North West Mull Community Trust to register an interest in buying the Inner Hebridean island, hoping to attract new residents and increase economic activity. A mere six residents are reported today, while there were some 500, two hundred years ago, and 800 at peak occupancy. The Act is by no means new, but this appears to be the first case in which it has been cited in the purchase of an island. I think I’ll wait until another appears, one of the smaller bargains at around £250 k.
I’m always intrigued to see how often small islands around Scotland come up for sale – even more so when I think that I could maybe sell up everything (and I really mean EVERYTHING) and maybe have the one of the cheapest for myself. Then stuff like ‘Cost of ownership’ and ‘Reality’ (not to mention ‘Eating’) start to appear – and I stop having such foolish thoughts. Liken it to buying a second-hand (or even a new) Ferrari – you might get it home and enjoy looking at it, but for most ‘ordinary’ folk, the first year would probably ruin them with the various running costs if they actually drove it too. And don’t even think about the pain of any repair costs if warranty or insurance did not apply. But back to the island. On offer is the island of Little Ross, with offers over £325,000 being invited. It will be interesting to see if it sells, as the trend has (for the ones I’ve eyed up, and the sale info has not been kept private) been for them to hang around for a while, not sell for ages, or have their price dropped to help them along – or they do sell, but the details are held private, with hints that the price was not changed (much). The lighthouse tower – which is not included in the sale – was designed and built by Alan Stevenson at the mouth of Kirkcudbright Bay to close the gap between other lighthouses at the Mull of Galloway and Southerness. and first lit in 1843. It was manned until 1960. In this case, the island comes with an interesting history. In 1960, the lighthouse keeper was killed by a colleague. Keeper Hugh Clark was found dead on the island and his assistant Robert Dickson was later tried and found guilty of his murder. The listing includes a six-bedroom, B-listed cottage and courtyard which is next to an operational lighthouse tower which is not part of the deal. Looking at recent news, I spotted a castle up for sale, for mere £3.75 million. Admittedly, Glenborrodale Castle actually includes TWO isolated islands (Risga and Eilean an Feidh)along with its 16 bedrooms, not forgetting the tennis court, gym and sauna, commercial kitchen, games room, boat house with jetty, and of course, live-in accommodation for your staff. But a look at recent castle sales and stories show they are just a liability, bringing annual maintenance bills which will (like the apparently desirable Ferrari mentioned at the start) soon cripple you financially. I first noticed Rubh’a Chruidh for sale back in 2010, seven years ago, when I expressed my own opinion that the price tag of £430,000 was a little ambitious. I went further, suggesting that in the market of the time, a price of something closer to £100,000 might have been more realistic, and noted that having been reported as sold, the then listing of properties online showed that the sale had not been made, and it was ‘For Sale’ again. Mr Hamilton, a keen sailor, fought off international interest to buy the island in 2010 for £426,000 and after demolishing the existing bungalow commissioned his new home in 2012. Mr Hamilton, who demolished the only house on Rudh-A-Chruidh, an old bungalow, to make way for a stunning architect designed home, owned the island, which has its own helipad and boathouse, for six years. There’s no indication in the news story about the cost of the “stunning architect designed home“, but the lucky owner clearly made a nice little profit from the sale of the island, which was on the market for offers over £950,000 and he confirmed had sold for “near enough the asking price”. Out of interest, the monument atop the hill behind the house is for David Hutcheson, founder of the Hebridean ferries which evolved into Caledonian MacBrayne, CalMac. Seriously small cash for your own island, even compared to some sales I’ve noted in recent years, and with some prices having to be cut by that amount in an attempt to generate interest among potential buyers. There is a tiny problem with this tiny island, and that’s its degree of privacy and/or isolation. As can be seen from the pic below, you may not be on the mainland, but under some criteria, I suspect you would not even be considered to be on an island since you are just not sufficiently far away. I have read of some larger, populated islands that are not much further away than this, and they either do not qualify, or have to fight ‘tooth and nail’ to get grants and other payments that would be more or less automatic if they were further out to sea. View of Crinan Harbour, and the Eilean da Mheinn, from the ridge above. Per the selling agent’s blurb, it’s been owned by someone who just liked being there, and is now a ‘fixer upper’. Or, if you’re like me, just ready to move into as a bargain, not inflated by some damned developer who has ‘upgraded’ it, and inflated the price to make a quick profit. Harbour Island is reached in a matter of minutes by boat from Crinan Harbour and is therefore a fantastically located private haven without being too remote. Its coastline is rugged with wild gardens and woodland inland all of which attract a spectacular array of wildlife and seabirds. The house comprises around 1000 square feet and is single storey built under a slate roof. Although in need of significant improvement, it offers flexible accommodation all on one level, with access from a porch to the side which leads to the hallway with two storage cupboards. The hallway gives access to all the main rooms: a sitting room with conservatory off, kitchen, three bedrooms and a bathroom with separate WC. There is a wooden outbuilding with guest room and shower room, a boathouse and slipway. The house, outbuildings and grounds are in need of significant improvement but Harbour Island offers a wonderful opportunity for a nautically-minded new owner to make their mark on this unique place. Harbour Island, Crinan, Lochgilphead, Argyll, PA31 8SW. Offers Over £500,000. Have fun, as commenters have pointed out one or two little ‘oopsies’ in that article. A SCOTTISH island has had its asking price slashed by £500,000 after failing to attract a buyer in a year. With its commanding position in the middle of a loch, King’s Island could be fit for royalty. But King’s Island, translated from the Gaelic Eilean Righ, failed to find somebody willing to pay £3 million. It has now been re-advertised at £2.5 million. The isle off the Argyll coastline within Loch Craignish was put on the market by a top City trader in June last year. It has been owned since 1999 by former Goldman Sachs market trader, Christian Siva-Jothy, who once enjoyed almost mythical status among the City’s financial community. That all came to an end in 2011, when he closed down the $200 million business he began after leaving Goldman Sachs and made a stunning confession about his ability to play the market. Mr Siva-Jothy wrote to investors in his firm SemperMacro: ‘In this business, you are only as good as your last few trades. According to the latest story, while there has been some interest, this has been from overseas, and nothing has come of it. As well as a four-bedroomed principal house (there is another), the 238-acre island comes complete with a giant 500sq metre helicopter hangar, two slipways and a jetty. King’s Island has had a number of colourful owners over the years. In the 1930s, it was home to Sir Reginald Johnston, the retired tutor to the last Chinese Emperor, Puyi. Sir Reginald built a Buddhist temple on the island and flew the Manchukuoan flag in the Chinese-style gardens. It later passed into the hands of a retired Indian Army officer, Lord Wilfred Brown and James Waldegrave, the Viscount Chewton. The houses are described as being refurbished, and have mains electricity and broadband. I have to confess I have never heard the name before, or think I ever saw the name on a map, but the little island of Gigalum has been placed on the market, and it looks like a bargain, with offers of only over £550,000 being asked for. While I won’t be placing an offer, I do watch the prices of houses being sold around me, and even in the east end of Glasgow, that’s not necessarily a rare selling price. The island covers about 19 acres, has a jetty that aids access to the nearby islands of Gigha and Cara, and only one building – Gigalum House, built in 1980 and described as having a unique structure with a central octagonal core as its living space, surrounded by four wings housing three bedrooms and a kitchen. The estate agent states that it has potential, subject to planning consent, for a renewable energy scheme or more homes. The price seems to have dropped to “offers over GBP 450.000”. There’s also a complete set of pics in that offer for sale, including views of the octagonal Gigalum House. I wonder if the rules for selling islands are the same as for soft-tops (convertibles)? Unless you positively, definitely, have to, must sell it tomorrow, then you keep it under cover until the first sunshine of spring greets the World with blue and cloudless skies. Failing to do so reportedly knocks a whole chunk of money of the price you can expect to set and get. Tanera Mòr is the largest and only inhabited island in the Summer Isles in Wester Ross, and cover approximately 800 acres (324 ha). It is now being offered on the open market by its current owners (the Wilder family) after the local Coigach community declined the option of a buyout due to the number of local project they already have underway. The family bought the island in 1996, after selling their dairy farm in Wiltshire. The island comes with six properties for holiday letting, a sailing school, and a café and Post Office. The latter were developed within an old boathouse, and the Post Office has permission to issue its own stamps. 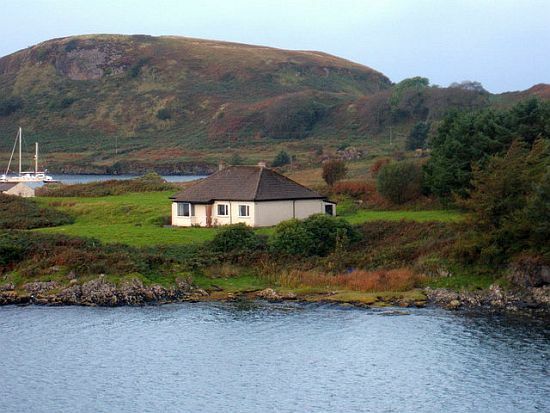 Tanera Mòr island has been placed on the market with a guide price of £2.5 million. The sale is being handled by the Inverness office of property consultants CKD Galbraith. They seem to have a thing about the old red telephone box there too. I wonder of any of them work? A PRIVATELY-OWNED Ross-shire island is on the market once again – with its price tag slashed by over half a million pounds. Tanera Mòr, an 800-acre island in Wester Ross, was put up for sale last May at an asking price of offers over £2.5 million. But despite attracting worldwide interest, no buyer could be found for Tanera, the largest and only inhabited island of the Summer Isles which lie off Achiltibuie. Now selling agents Savills and CKD Galbraith are jointly marketing the island for offers over £1,950,000. It was fascinating to read the reality of life on the tiny island of Muck, which has just moved into the world of 24-hour mains electricity supply. 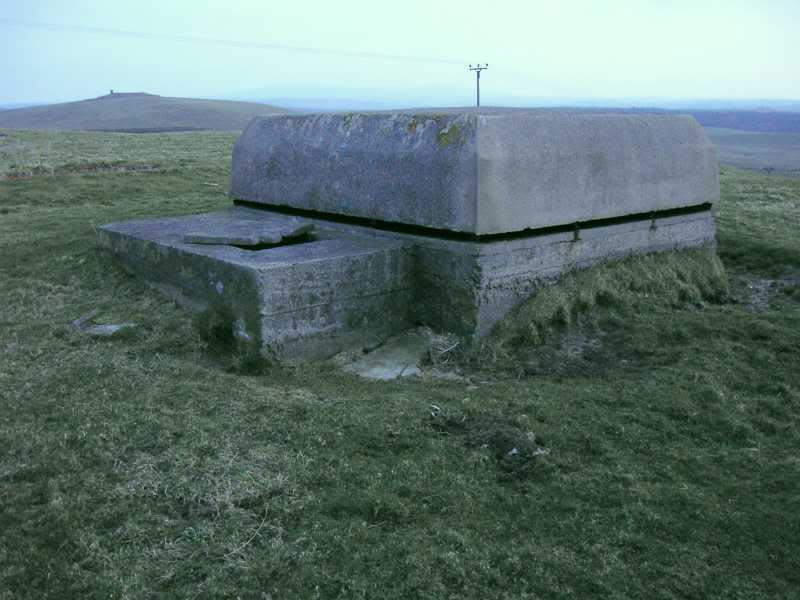 Previously, the islanders (numbering 38 at the time of writing) were limited to a schedule, determined by the fuel supply of the island’s diesel generators which first provided electricity in 1970, but could only provide power for 14 hours a day, from 11 am to 5 pm, and 11:30 pm to 7 :30 am. The population has fallen over the years, having peaked around 300 at the start of the 20th century. This meant using candles or tilley lamps similar for lighting, missing the end of films, and problems with food stored in fridges and refrigerators, with the island’s tearoom having to organise things to make sure provisions were safely stored. The island’s generator was only rated at 10 kW, which meant that users had to arrange schedules for using appliances such as washing machines that drew large amounts of power when operating. There’s a fair few outright lies being circulated by supporters of Donald Trump, posting comments after articles critical of the Dump to the effect that wind power doesn’t work, but Muck is benefiting from developments in this area (albeit I am not suggesting the island has suddenly grown a giant wind farm), and its new supply is built around a new installation combining six 5 kW wind turbines with a 30 kW solar panel installation. Muck joins Eigg, where residents now get more than 90% of their electricity from hydro, solar and wind schemes, and micro hydro-electric schemes, wind turbines and photo-voltaic cells saw the Isle of Eigg Heritage Trust named overall UK winner in the Ashden Awards for Sustainable Energy for 2011. The new supply was made possible when Muck Community Enterprise Company received a grant of £978,840 last year, to help introduce the system of wind turbines and solar panels. The lack of a continuous electricity supply limited the opportunities for business and growth on the island, but the new supply is hoped to improve this, so the tearoom, hotel, and two B&Bs on the island should benefit from increased numbers of visitors who can also be better catered for. I have to admit to being a little intrigued by the mix of renewables as used on Muck: 5 kW of wind plus 30 kW of solar. Considering the usual image of weather conjured up by thoughts of Scottish islands, and having been on one or two myself, I’d have thought the lion’s share would have gone to wind, with solar acting as the backup. It will be interesting to see if there is a later story, reporting a change, or if this initial division proves to have been correct. Yet another island sale making it into the news, this time Ailsa Craig, or Paddy’s Milestone to those who know it better. It’s actually an old story, but we must have missed the initial sales offer when it appeared in the news almost two years ago, in May 2011. Back then, a price anywhere up to £3 million was suggested, but the island has failed to attract any prospective buyers in that time, and the price has chopped to a mere £1.5 million. Owned by the Scottish peer Archibald Angus Charles Kennedy, 8th Marquess of Ailsa, the island is believed to be a volcanic plug over an extinct volcano, and rises to 1,100 feet above sea level. It is also known as home to one of the largest gannet colonies in the world, hosting some 36,000 breeding pairs which are watched over by the Royal Society for the Protection of Birds (RSPB). This also means that there are restrictions in place as regards any development on the island which might interfere with the birds’ breeding habit. The island’s portfolio includes 220 acres and contains a house, lighthouse, ruined castle, three former lighthouse keepers’ cottages, and a quarry which has provided most of the World’s finest curling stones. The family responsible for the stones lived and worked on the island until a few years ago, but demand fell and they had to leave. However, the stone is still being used, and many blanks and part-worked stones still lie in the quarry. Trips are made to collect these when needed. Known as blue hone granite, stone from the quarry provides as very dense and nonporous form of granite, which resists the penetration of moisture and prevents the formation of pitting of the carved stones as they stand on the ice. Although the business was ultimately based in England, the company name was originally derived from both the island of Ailsa Craig, which lies off the west coast of Scotland (also known as Paddy’s Milestone), and the name of the original founder, who came from Glasgow, Alistair Edward Stuart Craig, also known as Arthur. Arthur Craig had started his business in Glasgow, where he established Craig Bicycles, and manufactured his own quality bicycle which had the registered trademark of a man standing on the peak of Ailsa Craig, holding a Craig bicycle at arm’s length, and with the slogan “As strong as the rock of Ailsa Craig”. It seems that island takeovers by their community is becoming a popular option. While I can’t recall noticing it very often any more than a few years ago, I seem to have been noticing it appear in the news with rather more regularity in recent years. Most of those noted here have therefore been recent, and some are still being considered, so it’s hard to gather any news as to their success with the passing of time, but maybe in a few years (as in ten or more) it will be worth digging into what will, by then, be old posts in here, and having a look to see how they got on. Of course, any that hit the news in the passing years will probably be mentioned somewhere in here, hopefully for the better. The residents of Raasay are to be consulted on whether they would want to take over the running of the island. The Scottish government has suggested a community buyout as one of three options to resolve the future of how the isle’s sporting rights are managed. Another option is to offer the islanders the lease to the rights for up to 175 years. The third is to put the lease out to tender but with conditions that ensure it still benefits islanders. Environment Minister Paul Wheelhouse said Raasay Crofters’ Association has been given the lease until 1 March to allow time for the consultation to happen. via BBC News – Community buyout of Raasay suggested.